Athena (/əˈθiːnə/; Attic Greek: Ἀθηνᾶ, Athēnā, or Ἀθηναία, Athēnaia; Epic: Ἀθηναίη, Athēnaiē; Doric: Ἀθάνα, Athānā) or Athene (/əˈθiːniː/; Ionic: Ἀθήνη, Athēnē), often given the epithet Pallas (/ˈpæləs/; Παλλὰς), is the goddess of wisdom, courage, inspiration, civilization, law and justice, mathematics, olive oil, strength, war strategy, the arts, crafts, and skill in ancient Greek religion and mythology. 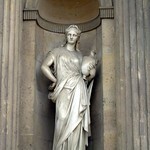 Minerva is the Roman goddess identified with Athena. 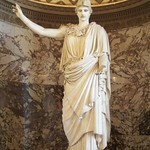 Athena is known for her calm temperament, as she moves slowly to anger. She is noted to have only fought for just reasons, and would not fight without a purpose. Veneration of Athena was so persistent that archaic myths about her were recast to adapt to cultural changes. 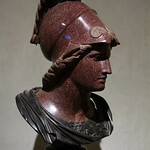 In her role as a protector of the city (polis), many people throughout the Greek world worshipped Athena as Athena Polias (Ἀθηνᾶ Πολιάς "Athena of the city"). While the city of Athens and the goddess Athena essentially bear the same name (Athena the goddess, Athenai the city), it is not known which of the two words is derived from the other.